Solar to Hydrogen – Can We Turn the Desert into a Hydrogen Plant? Generating solar energy in the desert is a tempting challenge. The abundance of solar irradiation and the dry air with an almost cloudless sky provide almost perfect conditions for driving PV plants. Not surprisingly, people have thought about this possibility, and some projects have already been proposed which, however, so far have not developed beyond the first planning stages. Furthermore, these projects are still not on financially safe ground. In any case, they will require a tremendous amount of financing and that is, it seems, their most vulnerable point. One of those futuristic project ideas, called Desertec, provides some insight into its deliverables and may thus be used as a reference. According to planning, it should be able to transmit in 2020 some 60 TWh of electrical energy from the north African desert right away to energy-hungry Europe. This roughly corresponds to the annual production of 6 nuclear plants. Electricity output is expected to grow continuously over the years with a target of 700 TWh annually in 2050. One may, of course, question whether transmitting electricity over several thousands of kilometers is the smartest way of doing things. The losses in the transmission network will be significant, as discussed in an earlier posting. It´s not only the length of the distribution grid eating up a substantial part of the energy produced by the desert sun. As it does not make sense to transmit electricity during daytime only, part of the generated power would have to be stored for transmission during the night. This, too, consumes some energy which in turn reduces the efficiency of the whole project. Rather than sending solar power via large distance cables to Europe, one may ask if using it for liquefying hydrogen might be a better option. Given the state-of-the-art technology the expected Desertec output for 2020 could provide some 6 Megatons of liquefied hydrogen annually which may be shipped across the Mediterranean for further useage. Applying model calculations taking into account the losses during transportation and handling we found that this amount of liquid hydrogen could provide sufficient energy to drive some 3 million cars with an average annual driving distance of 20,000 km. This corresponds to the stock of registered vehicles in a country like Hungary (2008 data). Going over to the even more optimistic scenario for 2050, then the collective effort of all desert-based PV facilities sould enable the production of at least 70 million tons of liquefied hydrogen. Transferring this figure into cars on the road, we find that this amount provides fuel for not less than 35 million autos. This is reoughly equivalent to the number of registered cars in Italy (2008 data). In this way solar energy, via its hydrogen derivative, could become a serious competitor to gasoline and diesel. Its advantages are obvious with both, solar energy and hydrogen being available in virtually unlimited quantity. Moreover, the environmental benefits with a substantial reduction in CO2 emissions are equally promising. Bear in mind that the transport sector is responsible for about 25% of all CO2 emissions in Europe. 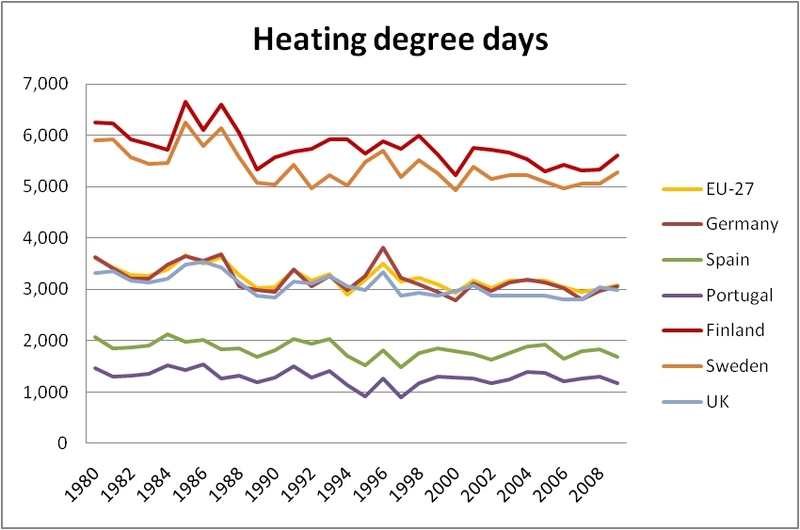 What are heating degree-days and what are the advantages and limitations of that conept? Generally speaking, heating degree-days (HDD) represent a sensible measure in order to estimate how much energy must be provided for heating purposes. It´s cold outside, you turn on the heating. The colder it is, the more you have to heat, if you want to keep the room temperature at a convenient level. As a consequence, you need more energy, if the outside temperatures are lower. Thus the temperature difference between inside and outside to a large extent determines how much oil, gas, wood or electricty you need in order to keep your place cosy and warm. But this is not the only parameter having an impact on your heating bill. Another factor of crucial importance is the numer of days you have to keep the heating running in the first place. Wintry weather conditions and their duration can vary considerably from one year to another. Last year, at the beginning of November, outside temperatures in northern Europe were already below 0° C. This year, however, in the same region the thermometer has hardly ever touched the freezing point, thus saving a lot of energy costs. So we see that two crucial parameters determine the heating effort: the temperature difference between living room and outside on the one hand and the duration of the period when the heating is on. In this formula, d represents the number of days when heating is considered to be required and Tm is the mean outside temperature defined as Tm = (Tmin + Tmax)/2. Thus, Tm is an average value of minimum and maximum temperatures during a certain period. But when is the heating actually on? According to Eurostat the heating is on when Tm <= 15° C, whereas for Tm > 15° C it is off and then HDD = 0. In this way, we have obtained an important indicator for the amount of energy which is needed in order to keep our living or working space at an agreable level. However, HDD in itself is not sufficient to determine or even estimate the actual amount of energy necessary for heating purposes. To that end, more input is needed. In particular, we need to know how big the energy flow from our living and/or working premises to the outside world is. Clearly the heat flow is directly proportional to the difference in temperatures as indicated in the formula for HDD. Yet, the amount of heat passing from the cosy appartment to the cold and sometimes frosty environment also depends on the insulation we use in order to reduce the loss of heat. The insulation in turn is closely linked to the construction materials used. Fig. 1 gives us an overview over HDD in the EU-27 and some selected countries. The raw data for this have been taken from Eurostat. Apparently, there is a clear distinction between several countries, depending on their geographical location. HDD for Germany and UK are closely following the EU average. The northern countries Sweden and Finland are placed well above that average, whereas the southern Member States Spain and Portugal find themselves well below that value. 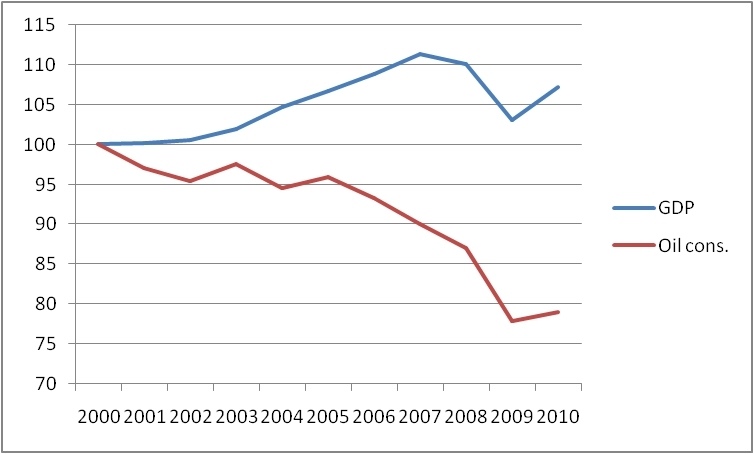 The mean deviation from the EU average amounts in the case of Sweden and Finland to 67% and 79%, respectively. Spain and Portugal, as the antipodes in HDD, are as far as 43% and 60% below the European mean value, respectively. HDD reflects the climatic conditions of each country. Average temperatures are considerably lower in Europe´s northern periphery and in the southern part. Therefore the difference in HDD between Finland (5800 on average) and Portugal (1300) is easily explained. Taking HDD as the only reference, Finland would need more than 4 times as much energy for heating than its couterpart. 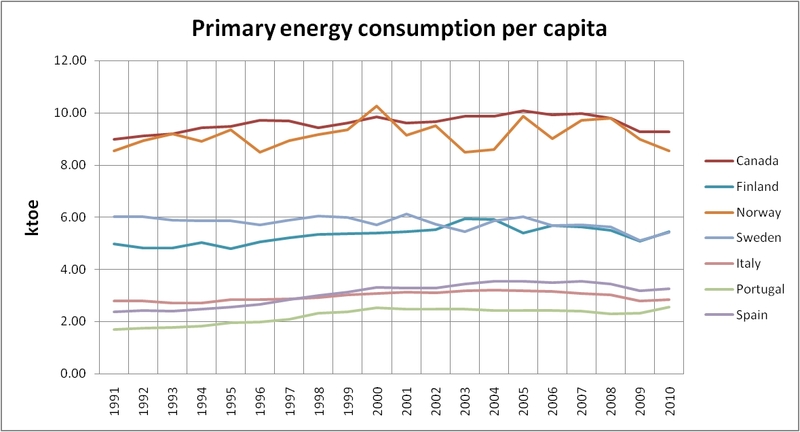 However, comparing these figures with the energy consumption per capita for both countries (Finland 5.3 ktoe and Portugal 2.2 ktoe, annual average for 1991-2010) yields a clear indication that there must be some features which tend to soften the sharp discrepancies. Among these are the standards for heat insulation (which can vary between different countries), the number of cooling degree days (having an opposite north-south tendency) and the level of industrialization. It doesn´t come as a surprise that bigger countries consume larger amounts of energy than smaller ones. In general, at least. And yet, there are exceptions to this rule. US consumption of primary energy was 2204.1 Mtoe in 2009 according to BP´s Statistical Review of World Energy 2011. In the same year Canada used some 312.5 Mtoe. The two neighbours are roughly equivalent in terms of economic performance (with GDP per capita in the US being larger than the respective quantitiy for Canada). Thus the main reason for explaining the difference is by reference to the population numbers. Here the US with 307 millions outweighs Canada with 33 millions. However, there are also other factors coming into play, as we shall see later. A nice example that population is not the only parameter steering energy needs is given by comparing Germany and Mexico. Although Mexico has considerably more inhabitants (107 millions vs. 82) its consumption figures are significantly lower than the German ones (167 Mtoe vs. 307 Mtoe). A sensible quantity for measuring the energy hunger of a particular economy is the primary energy consumption per capita. In that way, size effects stemming from largely different populations are normalised. The philosophy behind this is similar to the one of energy intensity which measures consumption per unit of GDP. In the following we consider a number of developed economies and look at their energy hunger per head. We will find out that there are considerable differences between those countries although, at first sight, they may appear to be very similar in nature. The raw data for the following investigations have been taken from BP´s Statistical Review of World Energy, from the UN Statistics Division and from the CIA World Factbook. Although each of these countries is part of the wealthier economies of our planet, their energy consumption per head reveals some striking differences. We may observe that during the past 20 years the figures have not changed dramatically. 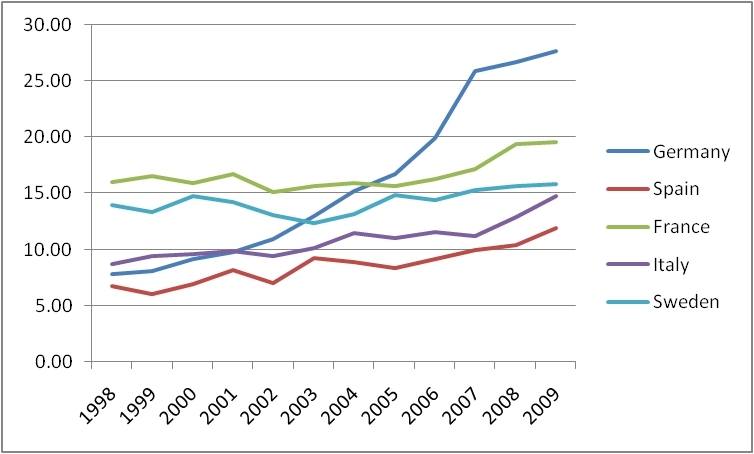 Norway´s figures, though, show some variation, however, without any clear trend to higher or lower values. One of the intentions of our choice was to highlight consumption characteristics between northern and southern countries. And indeed, the southern branch consisting of Italy, Portugal and Spain is well separated from their northern counterparts Canada, Norway, Finland and Sweden. In fact, there is even a significant gap between Sweden and Finland on the one hand and Canada and Norway on the other. Having the north-south distinction as a particular feature we may come forward with some explanations on the seemingly unbridgable gap between the northern and southern economies. Obviously, one of the strongest arguments is based on climatic variations. Average temperatures are lower in nordic countries than in the southern ones which explains part of the difference. In order to have a reliable measure on how energy consumption is triggered by climatic circumstances we apply the concept of heating-degree days (HDD) which is used by Eurostat. Apparently, there are two parameters governing the HDD: the temperature and the number of days when heating is necessary. 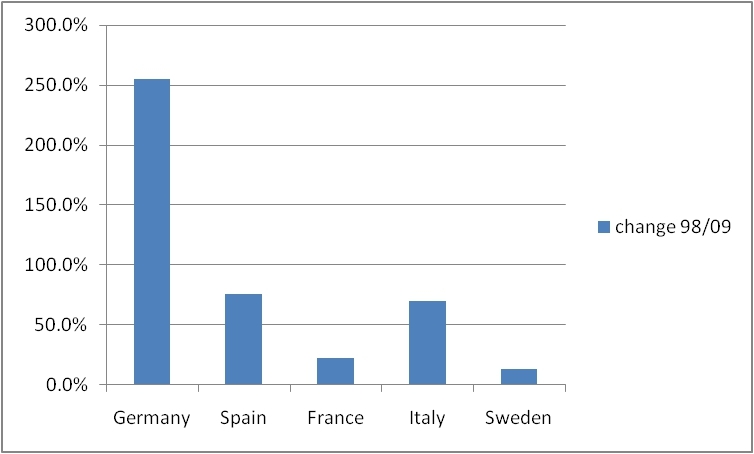 Without going into details we may state that the nordic countries (except Canada) had more than 5000 HDD in 2009, whereas the Mediterranean countries managed with well under 2000 HDD. Although the HDD concept is able to explain much of the difference, it is still not reflecting reality in total. The other factor coming into play here is the economic performance of each country expressed in GDP per head. Here, too, we see a gap between the two blocs. In order to visualise differences we take the average of both, the GDP and the energy consumption per capita, and scrutinize the deviations of both of the blocs from the mean value. The result is given in Fig. 2. Fig. 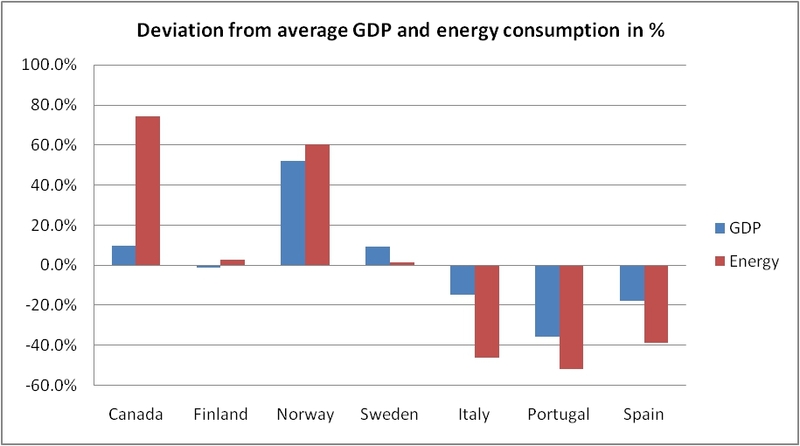 2 Deviation of GDP and energy consumption per head from average in %. Data from 2009. Fig. 2 gives us an indication that the energy intensity (which is pegged to the GDP) is closely linked to the consumption per capita, thus reflecting the economic performance of a country and its inhabitants. Those countries with a higher GDP per head tend to have also a higher primary energy consumption per inhabitant than the countries with a below average GDP per capita. Although the term “energy per capita” has some intrinsic limitations, it represents nevertheless a sensible quantity if we are to understand consumption patterns and their causes. It is particularly sensitive to take into account factors like the degree of economic development and the temperature zone of a given country. Otherwise our conclusions might be distorted, especially when comparing countries with different economic background and/or geographic distribution. It goes without saying that Canada will consume more energy per inhabitant than, say, Portugal, simply because of its relative positioning on the globe. However, geography does not account for everything. We have to make allowances for differences in industrial and economic power as well. 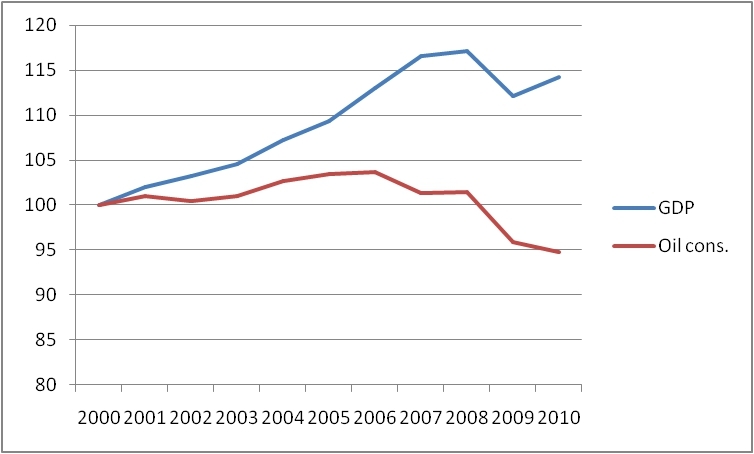 And again Canada, having a considerably higher GDP per head, is better off than Portugal. Putting everything together will allow us to draw the right conclusions from the rough picture the concept of “energy per capita” provides us with. Solar Energy from the Desert – How Much Do We Lose? The idea of producing solar energy in the desert appears, at first glance, quite appealing. There is a lot of sunshine available, and annual fluctuations in productivity are negligible compared to locations further up north. The main problem is just to transport the electricity generated in the desert to the consumers who, generally, are not residing at the place of production. Desertec is an ambitious project aiming at producing large amounts of (mainly solar) energy in the desert and transmitting it across the Mediterranean to the consumers in Europe. The anticipated transfer volume is expected to rise from 60 TWh per year in 2020 to about 700 TWh in 2050. 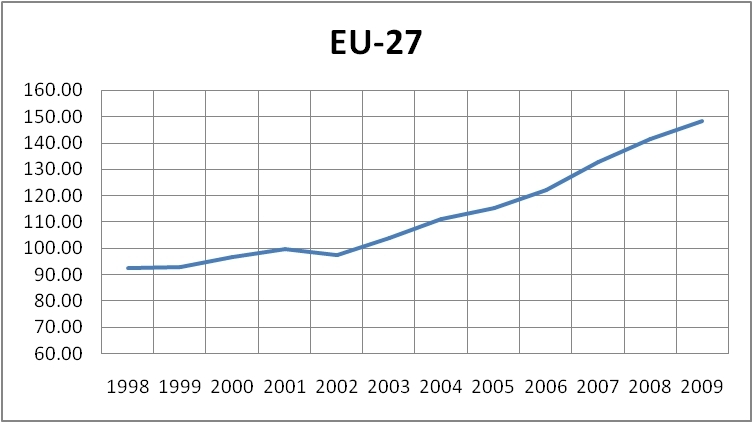 The latter figure corresponds roughly to 20% of all electricity generated in the 27 EU Member States in 2007. So there is indeed a substantial amount of energy available in the desert sun which was clear from the outset. The crucial problem we are facing here is the following: transporting energy requires energy, and the longer the transport route the more energy you need for transporting, i.e. the higher the losses. Even with the best available technology we would expect to get less electricity out of the socket than what has been put in at the beginning of the transmission line. High-voltage direct current (HVDC) is currently the best available technology for transmitting electricity over very long distances. The losses amount to a minimum of 3% per 1000 km. Thus, for a transfer volume of 60 TWh we would expect to lose some 1.8 TWh over 1000 km. Desertec estimates the length of its transmission lines to be more than 3000 km in 2020. In case that we would encounter transmission losses of at least 5.4 TWh per year. Taking into account the anticipated transfer volume and the expected length of the transmission network for 2050 we can calculate the power losses to be at least of the order of 75 TWh, i.e. more than the entire transfer forecast for 2020. To put things into perspective, the anticipated transmission losses for the Desertec project correspond to the annual output of 7 nuclear power stations (taking the Isar 2 power plant as a reference which, as the top performing German nuclear plant, produces an average of 11 TWh per year). Thus, apart from worries about the policitcal stability of the producing region and the related issue of security of supply which are clearly outside the scope of this posting, transmitting energy across the Mediterranean sea is facing technical limitations which, in their entirety, may add up to considerable factors. From a technical point of view, it is far from evident, that producing solar energy in the desert and pushing it over the sea to Europe is a smart way of doing things. It is certainly more promising to increase the number of solar power facilities in Europe and connect them to local grids rather than looking for a far-fetched solution. Nuclear energy has been the main source of electricity generation in Belgium since the 1980s , accounting for 52% of total production in 2009. Nevertheless, the new government plans to abandon nuclear until 2025. Given the tremendous share of nuclear in the electricity sector, this represents a enormous challenge which, to a certain extent, outweighs even Germany´s daring decision to switch off its last nuclear plant in 2022. In one of my previous posts I analyzed the situation in Germany and its potential to cope with the ambitious goal of phasing out nuclear by 2022. Then the conclusion was that there is indeed a realistic chance to meet the targets by enlarging the renewable sector. In Fig. 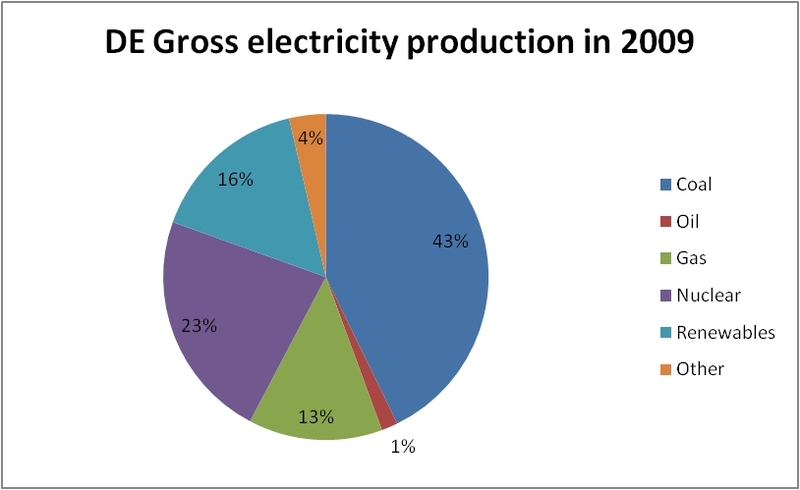 1 we see the distribution of the various contributions to the electricity grid in Germany in 2009. Among the renewable part wind is the predominant source outweighing hydroelectricity more than twofold. Solar energy, though growing significantly during the past decade, is laging behind, its share corresponding to about 17% of the power production from windmills. Fig.2 shows the equivalent for Belgium. The case of Belgium, however, differs in some aspects from the German case. First, its share of nuclear in the power grid is considerably larger than the German one. 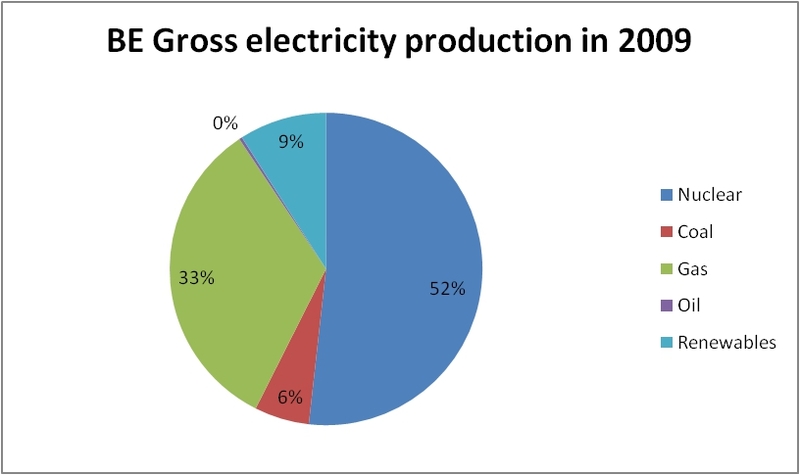 As mentioned above, this share corresponds to more than half of production output of Belgium´s power generators. In Germany, on the other hand, nuclear covered some 23% of electricity production in 2009. So, in relative terms, nuclear power has only half the weight in Germany than what is has in Belgium. Given the difference in size between the two countries, the absolute production figures are quite different with a total nuclear output of 134.9 TWh in the larger and 47.2 TWh in the smaller country. Thus, the task may look much less demanding for Belgium. However, the contribution of renewables to the electricity mix differs considerably between the two neighbours. In 2009 renewables accounted already for 16% of electricity output in Germany, whereas the corresponding value for Belgium was a mere 9%. Supposing that the current nuclear production may entirely be replaced by renewables at the respective deadline, the two countries have to undergo respective growth rates which are significantly different from each other. In Germany, renewables may grow by an annual average of 9.3% in order to cope with the challenge, whereas in Belgium the growth rate must be some 14.6%. This gives us a solid indication about what lies ahead of the Belgian government. What has been acheived so far? 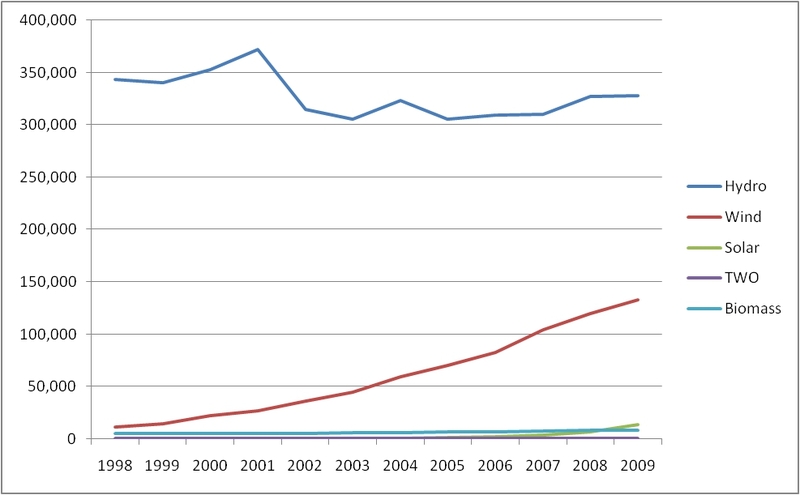 From 1998 to 2009 the primary energy production from renewable sources rose by 238% in Belgium. During the same period Germany faced an increase of 255% with both countries being by far the most dynamic in the renewable sector in Europe. Though these figures are indeed quite impressive we should not forget that during the twelve-year period from 1998 to 2009 Belgium has only five times managed to beat the growth rate it needs to keep during the next 14 years in order to switch completely from nuclear to renewables. Its German neighbour, on the other hand, could arrive at or even go beyond its expected growth rate seven times during the same period. Thus it´s not only the fact that the smaller country needs to keep a higher annual increase than its German counterpart, but moreover Belgium is required to maintain this fast pace of growth over a longer time. Given this, the prospect of replacing all nuclear capacities with renewables does not look as optimistic as in the German case. Most likely, additional sources of electricity generation will have to be tapped. One potential candidate is gas the use of which increased by more than 270% since 1990. Nevertheless, it will be interesting to see what share of renewable energy Belgium will have in 2025 when its last nuclear facility is supposed to leave the power grid. Renewables in Europe – Who Is the Champion? In this posting we analyse the contribution of various renewables to the energy mix. All raw data for the subsequent analysis have been taken from Eurostat. Renewable sources of energy have seen a dramatic increase in the past decade. However, the relative growth is not distributed equally between the various sources. Solar panels and wind mills are mainly associated with the increasing use of renewables. This is mainly due to the media giving considerable room to them when it comes to emphasizing the importance of alternative energies. And indeed the growth rates of solar and wind energy have been outstanding and, what is more, they are likely to continue growing over the next decades. However, growth rates may look impressive, especially when starting from a very low level. One should not forget that solar panels were hardly existing some twenty years ago, and the same is true for wind mills. Clearly, political targets served as a backbone for boosting their widespread use. This, in turn, has also led to considerable technological improvements, making solar and wind more competitive. Put in perspective, hydro power, though lacking any increase during the past decade, is still by far the biggest source of renewable energy. Although their advance is impressive, solar and wind are currently much smaller contributors to the energy mix than hydro, as can be seen in Fig. 1. Actually, wind mills may have a realistic chance to outnumber their hydroelectric competitors within the next 10 to 15 years, depending on their pace of growth. Fig. 1 Renewables in Europe. Production in GWh. From Fig. 1 it is obvious that all other sources except hydro and wind are for the time being less important. In fact, in this figure wind, TWO (tide, wave and ocean) and biomass are hardly distinguishable. Let us therefore zoom in on that picture, taking into account all renewables except hydro. As a result we obtain Fig. 2. Fig. 2 Renewables in Europe, all except hydro. Production in GWh. Then it becomes obvious how much bigger the input from wind mills to the energy mix is than the production from solar, biomass and TWO. Still, the difference is at least one order of magnitude. Nevertheless, with solar growth rates being considerably bigger than the ones for wind power it is possible that the latter might be overtaken by the former within the next 15 to 20 years. In order to get a feeling for the relative importance for solar, TWO and biomass, we zoom in once again on Fig. 2, thereby dropping the curve for wind energy. The results can be seen in Fig. 3. Fig. 3 As in Fig.2, but without wind. Production in GWh. From this, two things become clear immediately. 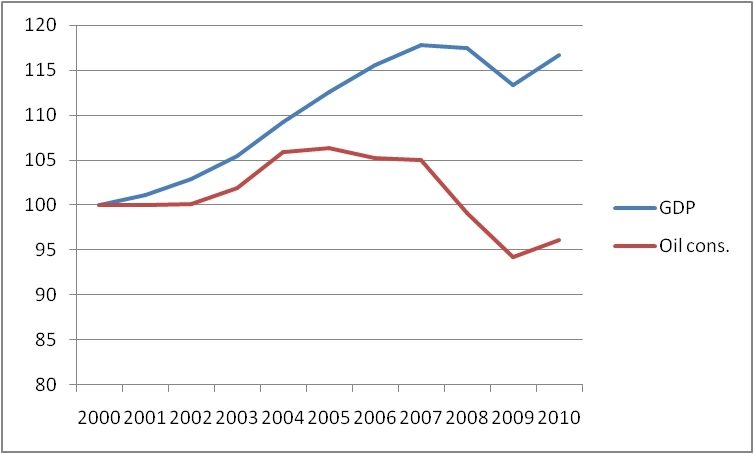 First, the contribution of TWO has been essentially stable over the period in question. In addition, its input to the power grid is virtually negligible with less than 500 GWh in 2009. In fact, production figures for TWO have gone down since 1998, when 590 GWh were produced, amounting to a reduction of 15% over the period in question. 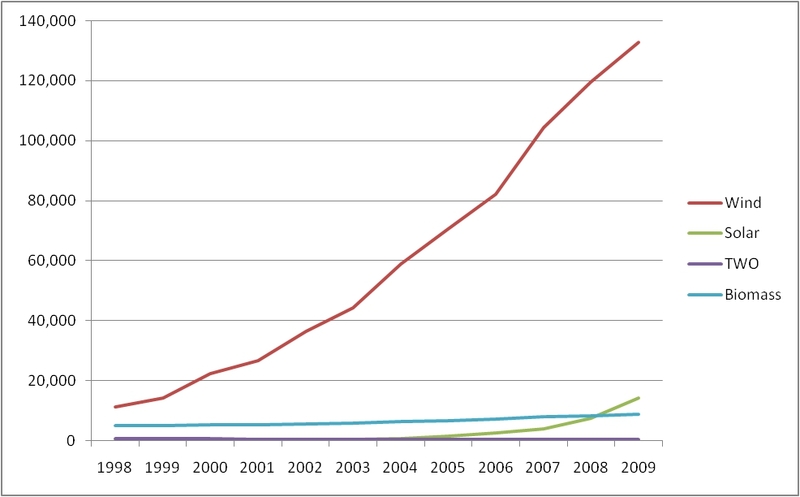 The second observation is that solar energy is growing much more rapidly than biomass. 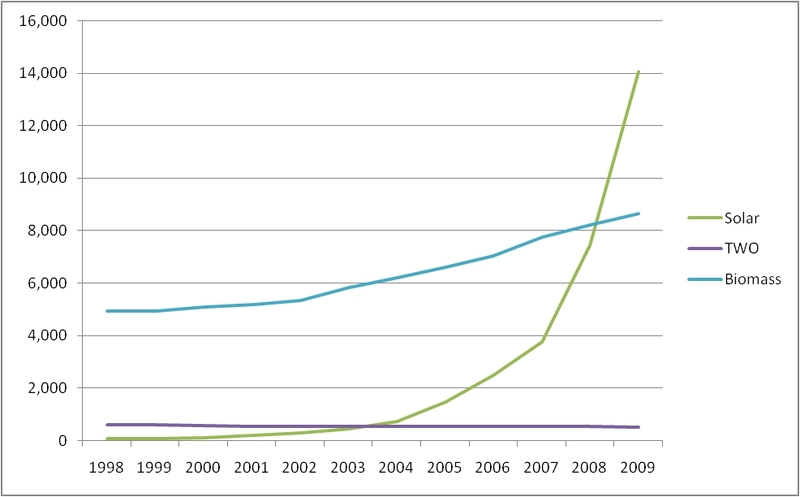 Actually, solar could overtake biomass in 2009. Hydropower and TWO may be considered as “established” technologies, i.e. they have been in place for the past 40 years or more. Their production capacity has remained unchanged for at least a decade. As a consequence, their output figures have deacreased rather than increased during that period. Wind, solar and biomass on the other hand have proven their potential to grow substantially. Their full capacity is still not exploited. In any case, it appears that their relative weight in the energy mix is going to become bigger in the future.